AFTER an intense renovation over the past 12 months, Ritz-Carlton, Bahrain Hotel & Spa offers a brand new look of its diverse array of dining venues and the pool area, setting new standards in design while at the same time inspiring the trendy lifestyle of today’s affluent traveller. Striking changes have been made to upgrade leisure and entertainment facilities adding an infinity pool, two outdoor Jacuzzis, a Thai lounge and chill-out sunbeds as well as a Ritz Gourmet Lounge. Primavera, the Italian signature restaurant situated on the first floor of the hotel has been redesigned featuring a contemporary ambience with an open show kitchen and a new outdoor terrace surrounded by palm trees offering views of the gardens. The Ritz Gourmet Lounge is inspired with its interior design and menu by the golden age of the Belle Epoque, a period in French history which started around 1890 and ended in 1914. The lounge offers traditional French dishes alongside with homemade pastries, cakes, breads, Arabic sweets and chocolates. 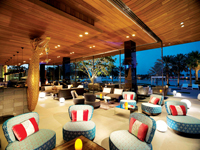 The venue also offers a new shisha terrace lounge, serving newly-composed flavours in oversized contemporary pipes, made of Czech hand-blown Bohemian Glass. A culinary journey to the East and West can be enjoyed at Thai and Overlook while relaxing by the waterfront. Thai is the place for friends’ gatherings, parties and special meetings in a stylish lounge atmosphere. The popular Overlook, an upscale poolside restaurant, is another unique design icon of the luxury resort and now welcomes guests with a fresh new look. With its wide selection of food stations such as oven baked pizza, BBQ, healthy salad bar and ice cream counter it offers something for everyone. To celebrate the season, Thai and Overlook are now open weekdays for external guests from noon onwards. Cook-out evenings on Wednesdays and Thursdays at Overlook are accompanied by a live DJ, playing Latin chill-out tunes, and salsa entertainment.